I have a few freebies on my blog. More to come soon. Free free to use them. They are for Personal Use only/Non-Commercial Use allowed. Please do not share in groups or claim as your own. All I ask is that you direct people to my blog to download. I hope that you enjoy the goodies I have and hope to make some more when I find time. I am showcasing an adorable art tube by StellaFelice7 called "Friends". Such a cute tube that can easily be used for your Spring and/or Easter tags. It is a multi-layered tube that has different colored dresses for the little girl and an optional hair color layer. She's just out enjoying the spring day with that soft and lovable bunny. You can purchase this tube at PFD. I am also featuring a fabulous kit by Dees' Sign Depot caled "Egg'stra Cute". This kit is so stunning! It contains 85 elements, 12 papers and 8 frames. It has a pretty pastel color palette of pinks, yellows and greens. It is packed with lushious floral arrangement and all kinds of Spring/Easter related elements to design with! You can purchase it at her store HERE. I added a brilliant animated chick by Sophisticat Simone from Animation Pack 57 available at CDO. Click on my tag to see full sized and animated. Labeled under:CDO,Dee's Sign Depot,Easter,PFD,SophisticatSimone,Stella Felice CT Tags | 0 people loved this post! 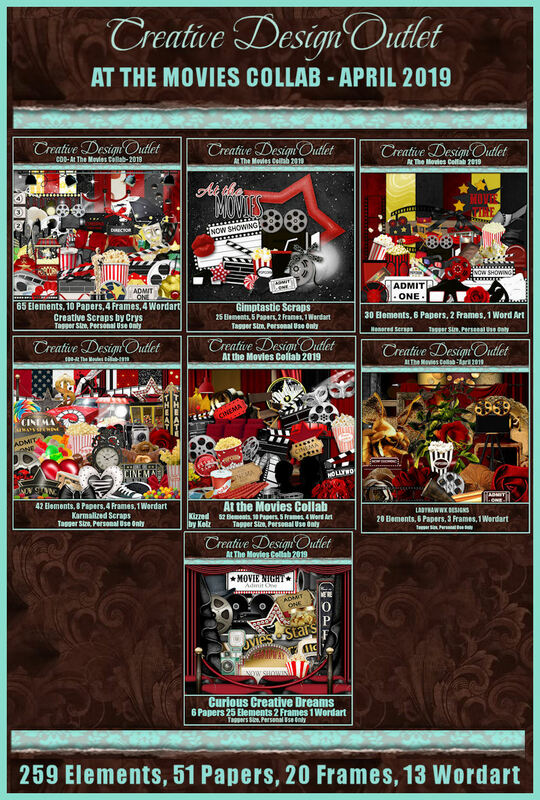 I am showcasing the beautiful scrap portion of CDO's collab called "At The Movies" by Curious Creative Dreams. The designers put together this collab this month featuring all kinds of movie related items. In total it contains 259 elements, 20 frames, 13 wordart and 51 papers! You can get the collab absolutely free if you purchase just three regular-priced kits. You can mix-and-match designers. Here is a preview of the entire collab but hurry because it goes away forever 10 pm PST 30 April 2019. This is my tag featuring only Curious Creative Dreams and an adorable art tube by Cuddly Rigor Mortis which you can purchase also at CDO. Click on my tag to see full sized and animated. 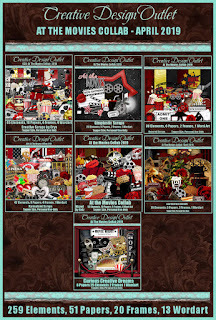 Labeled under:CDO Collabs,CT Curious Creative Dreams,Cuddly Rigor Mortis | 0 people loved this post! I am showcasing the stunning art tube by StellaFelice7 called "Dalia". It is a multi-layered tube with different colored layers of the outfit. It has an optional hair layer as well as a few hair accessories all on separate layers. What a beautiful tube to use for those upcoming Easter/Spring tags! You can purchase it at PFD. I am also featuring a fabulous Easter/Spring kit by Wicked Diala called "Bunny Hop". It contains 127 elements and 10 papers. It has a pretty pastel color scheme to it with all kinds of lush floral elements and easter and spring elements in it! You can purchase it at Dance In The Rain Scraps or Mystical Scraps. Click on my tag to see full sized and animated. Labeled under:CT Wicked Diabla,Dance In The Rain,Easter,Mystical Scraps,PFD,Spring,Stella Felice CT Tags | 0 people loved this post! I am featuring the stunning art tube by Rebecca Sinz called "The Night Watch". What a beautiful tube! What is she out there guarding? Noone knows but her! You can purchase this beauty at her store Elvenstar Art Tubes. I am also featuring a beautiful kit by Pink Paradox Productions called "Burnt Saphire". It has such pretty elements and a wonderful color scheme to it. You can purchase it HERE. I added two brilliant animations from Sophisticat Simone. The lamppost animation is a FTU one available at her blog Scrappy Bit of Fun and the falling leaves is from Animation Pack 212 available at CDO. Click on my tag to see full sized and animated. Labeled under:Autumn,CDO,CT Rebecca Sinz,Pink Paradox Productions,Scrappy Bit of Fun | 0 people loved this post! I am showcasing the stunning art tube by StellaFelice7 called "Marina". It is a multi-layered art tube with different colored layers of the dress and shoe layers. It has a different hair option and the jewelry and flowers on her hair are on separate layers. What a beautiful tube! You can purchase it at PFD. I choose a pretty kit called Lavender & Blueberries by Pink Paradox Productions which I thought went really well with this tube. It has all kinds of nice elements in it. You can purchase it at her store HERE. I am also featuring a brilliant butterfly animation by Sophisticat Simone from her Animation Pack 130 available at CDO. Click my tag to see full sized and animated. Labeled under:CDO,PFD,Pink Paradox Productions,SophisticatSimone,Spring,Stella Felice CT Tags | 0 people loved this post! I am showcasing a beautiful art tube by StellaFelice7 called "Cat's Fairy". What a stunning art tube! This is a multi-layered tube that comes with different colored options for the dress for the girl, wings are on separate layers with color options as well as for the cat, different hair options and different hair wreaths. You can purchase this beauty at PFD. I am also featuring a wonderful kit by Irish Princess Designs called "Flowers and Foxes". What a FAB kit this is! It contains 170 elements and 35 papers. A taggers delight! It has a color scheme of pinks, purples, whites and green. It is packed full of floral arrangements, lushious flowers and even some fur critters too! You can purchase this kit at Mystical Scraps. I used a FTU animation from Scrappy Bit of Fun. Click my tag to see full sized and animated. Labeled under:Irish Princess Designs,Mystical Scraps,PFD,Scrappy Bit of Fun,Spring,Stella Felice CT Tags | 0 people loved this post! I am showcasing the beautiful nautical animations that Sophisticat Simone made for the CDO Nautical Collab. She made 3 animations and I used one for this tag. You can get this awesome collab free if you purchase any four regular priced animation packs. They contain sea related elements to them such as wheels, anchors, sharks and more! But hurry, before this offers ends! It will expire on 31 March 2019 and will not be offered again. Be sure to check out Simone's animations HERE. I used a beautiful kit by Ladyhawwk Designs that you can purchase at CDO and a stunning art tube by Sara Butcher (since I didn't have the bonus tube) HERE. Click on the tag to see full sized and animated. Labeled under:CDO Collabs,Ladyhawwk Designs,Nautical,Sara Butcher,SophisticatSimone | 0 people loved this post!